It’s here! It’s finally here! 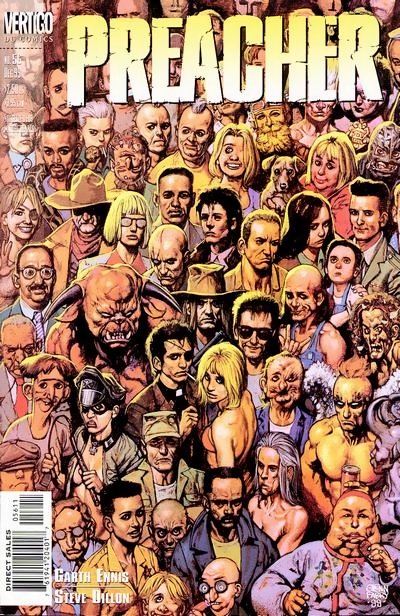 AMC is giving us a little peek at the upcoming awesomeness they have in store for us in 2016 when ‘Preacher‘, based on the comic book from Garth Ennis and Steve Dillon, comes to series. Every fan of this cult classic ought to be rollicking with glee about now at how awesome Jesse Custer looks on screen and in 3D! I am in love with this trailer! Preacher tells the story of Jesse Custer, a preacher in the small Texas town of Annville. Custer is accidentally possessed by the supernatural creature named Genesis in an incident which killed his entire congregation and flattened his church. Genesis, the product of the unauthorized, unnatural coupling of an angel and a demon, is an infant with no sense of individual will. However, as it is composed of both pure goodness and pure evil, it might have enough power to rival that of God Himself. In other words, Jesse Custer, bonded to Genesis, may have become the most powerful being in the universe. Check out the arm-breakingly amazing trailer for the series which will star Dominic Cooper and Joseph Gilgun! This entry was posted on Monday, November 2nd, 2015 at 12:21 am	and is filed under Books, Comics, News, Television. You can follow any responses to this entry through the RSS 2.0 feed. You can skip to the end and leave a response. Pinging is currently not allowed. « Billy Bob Thornton is Back For ‘Bad Santa 2’!! !